Each month, HeadStuff’s Visual section brings you a taste of cities around the world. Experience the art world’s world art through our contributors from New York, Melbourne, Amsterdam, Istanbul & Seoul. Before Orhan Pamuk began his novel about a man who collects the detritus of his Beloved’s life and gathers them in a museum after her death, he first bought the house in which he imagined she would live in and the things that she and her family would own. While the Turkish Nobel laureate was writing The Museum of Innocence on paper, he was also creating The Museum of Innocence in this building, located in a narrow street in the winding, hilly district of Beyoglu in Istanbul. Kemal is besotted with his (distant) cousin Fusun. For nine years he ate dinner and watched television at her family’s house. When they aren’t looking he took their things as mementos to soothe his lovesick soul. 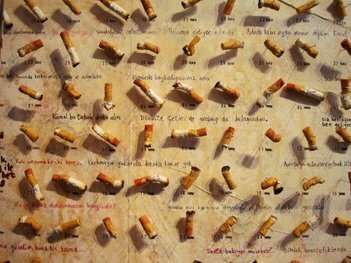 Entering the museum one immediately sees a giant display case where over a thousand cigarette butts are displayed, arranged according to the year in which Kemal collected them, many marked with smears of lipstick or Fusun’s favourite cherry ice cream. Most display cases are smaller and contain objects both prosaic – such as a number of empty perfume bottles – and poetic – such as a butterfly earring hovering in front of a ceaselessly billowing curtain. Marx said that capitalism cons people into endowing objects with seemingly-magical qualities which they don’t really possess. But with his exhibition, Pamuk shows that, when rescued from the devaluing relation of consumption and production, things have a curious and melancholic power, souvenirs of times rather than places and mute repositories of human emotion. From May until July, the National Gallery of Victoria is hosting an exhibition presenting a broad range of art from Indigenous women artists. The “broad range” is the exact quality which makes this exhibition so interesting and unique. The featured works come from both contemporary and historical artists and hail from both city and bush studios. This challenges the idea that authentic Australian and Aboriginal culture is only produced in the outback. 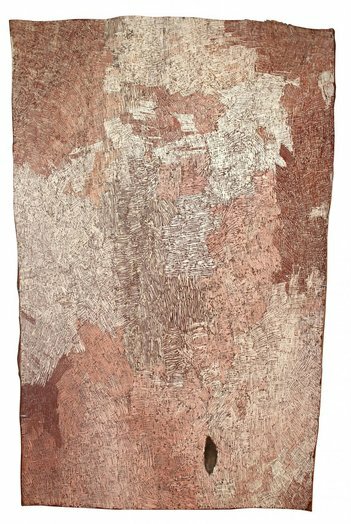 The layout of the exhibition itself also distorts a regular line of chronology, beginning with works produced in 2012 by Nonggirrnga Marawili followed later by Queen McKenzie whose work dates from 1994 to 1998. The art is accompanied by anecdotal references to the women’s influence by place and family, and the mythical figures which inspire many of the pieces are tangible throughout the exhibition experience. A preoccupation with detail, grids and shapes is a common quality of these women’s work. A close inspection of a painting will show minute attention to the placement of white lines, which from afar take on a cohesive quality of a symmetry which is nevertheless bold and confronting. Many of the pieces are long and rectangular, which lends an epic sense of time and perception. The mixture of contemporary and historical is striking, as the material used changes from bark to canvas, and the colours range from rustic browns to electric splashes of bright blue. Woven objects and sculptures also feature in the exhibition, which as a whole offers an inspirational and thought provoking collection. For all but the most devout luddite, the internet is intellectual quicksand for productive spare time. Even browsing diligently, and determinedly resisting the lure of ‘clickbait’, eventually and inevitably a familiar sense of disappointment ebbs into consciousness. Distraction of this sort is now a de facto aspect of contemporary life and, perhaps ironically, it merits serious attention. American artist Jordan Woolfson, whose retrospective MANIC / LOVE / TRUTH / LOVE at Amsterdam’s Stedelijk Museum has just closed, is one artist investigating the loftier consequences of a reality increasingly mediated through digital media. 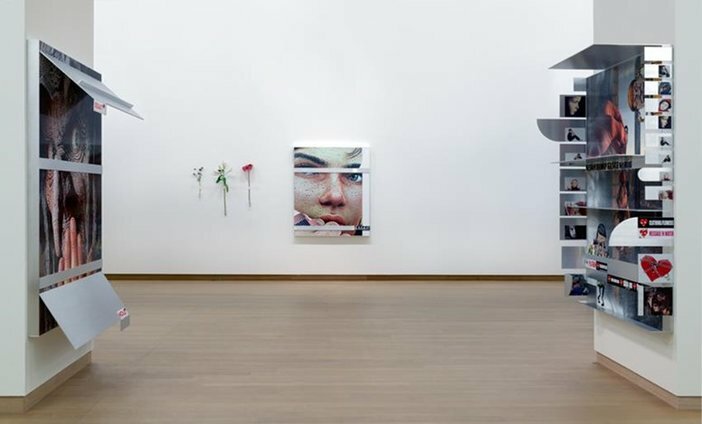 In his video installation, Favourite Things (2008), shown at the Stedelijk, he offers a more direct but less polemic encounter with the distracted browsing habits of contemporary internet users. The large format stream of a computer screen flicks between YouTube videos with most only half watched before the unseen browser pauses them. Having refused to interfere with the content, Woolfson’s piece essentially borrows a mundane experience familiar to most of its viewers and positions it within the unlikely context of a museum retrospective. 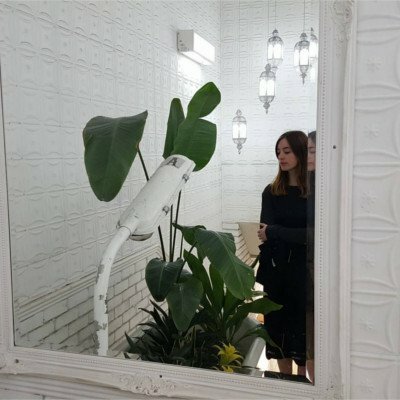 Having visited the gallery in an autodidactic bid to escape the cycle of repetitive, lowbrow entertainment, onlookers find themselves once again within its familiar thrall. In truth, the real magic of the piece is that it manages to be distracting itself. The experience of watching it is to experience two antagonistic phenomena – one a cerebral enquiry into the internet as a cultural phenomenon; the other 59 minutes of distraction – vie for attention. On a hot Saturday afternoon, we made a pilgrimage by subway from Brooklyn to Astoria, Queens. There, in The Museum of the Moving Image was an exhibition devoted to one of the city’s most iconic film directors: Martin Scorsese. Whether an avid fan or not, Scorsese’s works, with their particular depiction of violent subterranean New York, undeniably occupy space on your cultural register when you think of modern cinema’s iconic scenes, its heroes and of the sprawling Empire City itself. 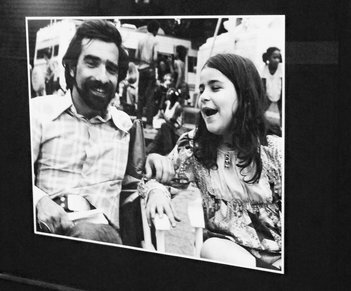 The exhibition opens onto a replica of Scorsese’s childhood kitchen and begins by piecing together a portrait of the young boy before he became a paragon – a quiet asthmatic, in love with cinema, growing up in a Sicilian American family in Manhattan’s Italian quarter, a community experience that would end up resurfacing in many of his most lauded pictures. But here the Scorsese narrative is imbued with a fresh vigour through home video footage from Scorsese’s family archives, interspersed with scenes from Goodfellas, Mean Streets and Scorsese’s documentary Italianamerican, ensuring that the personal details never become superfluous or indulgent, but contribute a fuller perspective on Scorsese the Director. Encompassing his entire oeuvre, the exhibition proper is structured around the motifs that span his films: Brotherhood, Men and Women, Lonely Heroes and NYC. 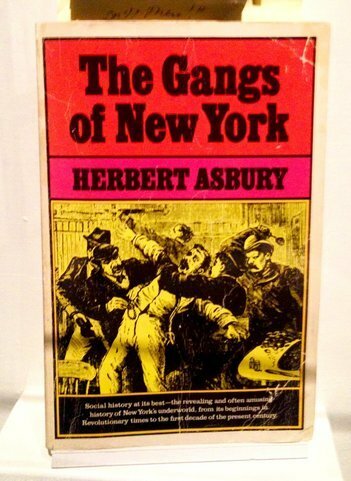 Objects and props from the films themselves form the core of the exhibition material; first drafts of scripts annotated by Scorsese and other screenwriters, DeNiro’s script from Taxi Driver, working storyboards with black biro scrawl, Scorsese’s copy of Herbert Ashbury’s The Gangs of New York brimming with post-it notes. You get a sense of the meticulous research and the intensive collaborative effort that his movies demanded. True to Scorsese’s deep reverence for cinematic history, and to his own modesty, there’s a large section of the exhibition focusing on the films and directors (mainly Italian and American) who sparked his love of cinema and influenced his own film-making, from Hitchcock and Fleming to Fellini and Rossellini. That Scorsese provided much of the material from his personal collection gave real sincerity and intimacy to the exhibition, while also giving a sense of his love for New York. 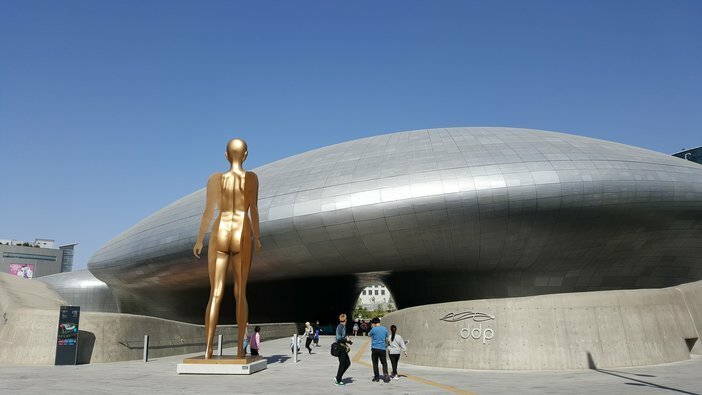 Across the river from Gangnam in the north of Seoul lies one of Zaha Hadid’s buildings, Dongdaemun Design Plaza. It literally lies; despites its gargantuan proportions it is out of the city’s high skyline, tucked away between the city’s ancient wall and the diaspora of counterfeit Louis Vuitton handbags, grilled squid and body lotion sold at the nearby street market. Can it even be called a building? Spaceship is more accurate. Futuristic blob too, though that takes away from the fact that it is a functioning purposeful building. I think a it’s a brilliance in its shapelessness; despite wondering around the plaza and buildings, both inside and out, for well of two hours, I could not draw even an outline of a map. Perhaps then, ‘blob’ is a fair description. Inside, the 24-hour market is packed with the kind of trinkets you find in the household section of Urban Outfitters and then some, and wonder why, oh, a toothbrush holder needs to be so well designed, or why aren’t all egg timers magnetic? Next to the interior design fun, a pop-up shop conceived from the collaboration of f(x), Red Velvet, Girls Generation, EXO and Super Junior, was also open, so if you fancied something you will never use emblazoned with a k-pop idol’s face- just your luck.